The GLSL,acronym of OpenGL Shading Language, forms part of the programming languages for the graphics card�s vertex and pixel processors, for the same reason as the HLSL of Direct3D or the Cg of nVidia. The vertex and pixel processors are processing units, to be found in the GPU (Graphics Processing Unit), which act respectively on the vertices and the pixels. In order not to repeat what I have already said on the presentation of programmable shaders, please see part 3 of the tutorial on graphics controllers. For the suite of this tutorial, we will now avail ourselves of the Demoniak3D platform to integrate and test our vertex and pixel shaders written in GLSL. You also need a 3D card that tolerates shaders. All the nVidia Geforce FX 5200 cards and higher or ATI Radeon 9600 cards and higher tolerate GLSL. Of course, the latest version of the graphics drivers from the manufacturers (Forceware for nVidia et Catalyst for ATI) should be installed. A little warning: programming vertex and pixel shaders is globally low level programming. Unfortunately, there are therefore often different comportments between the different 3D cards. The ideal, to code in GLSL and to be assured that one�s code will work everywhere, is to have 2 machines: one having an nVidia Geforce card and the other an ATI Radeon card... that�s a good start! Before going further, let us clarify the vocabulary. A vertex shader is a portion of code (a programme) which will be compiled then run in the vertex processor. Idem for the le pixel shader. A shader (also named shader program) is the general term for naming the block formed by a vertex shader and a pixel shader. In OpenGL terminology, the vertex shader is named vertex program and the pixel shader is named fragment program. For the following, I shall more often use vertex shader and pixel shader, which are, in my opinion, the most common terms to qualify shader programmes. The different shading languages (GLSL, Cg and HLSL) are fairly close to each other. Therefore the apprenticeship of one of them permits one to rapidly pass on to another. As far as I am concerned, I often consult the sources in HLSL before converting/adapting them to my needs in GLSL. This being said, we will now pass on to coding our first shader. For our first shader, I propose something extremely simple. The aim is to see the structure of a programme in GLSL and especially to understand the basic functioning of a shader. Once this step accomplished, the door towards the wonderful world of vertex and pixel shaders is open to you! According to the development platforms, these 2 codes may be found in two distinct files, or within the same. In the case of Demoniak3D, a shader program (vertex shader + pixel shader) is coded in one file only. But at this point, Demoniak3D offers a greater flexibility, because we can code our shader directly in XML script, thus saving the management of a large number of files during voluminous projects. The function of this first shader programme is to uniformly colour a simple mesh plane composed of 4 vertices. Figure 2 shows the rendering that you will obtain when applying this shader to the mesh. In order to understand the following, I advise you to download the accompanying project and to load it into Demoniak3D. The download is to be found at the bottom of this page. 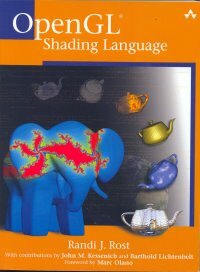 Before going into the details of the shader code, you must understand what applying a shader means. All 3D objects in Demoniak3D are endowed with at least one material. Material is fundamental because it intervenes in the calculations of the lighting, may have	textures and last of all, and it is what is most important for this tutorial, material permits liaison between a shader programme and a 3D object. where simple_color_shader is the name of our shader. We find this name again in the node shader_program. This node is the central node for the creation of a shader programme. The first line, [Vertex_Shader], marks the beginning of the vertex shader. Be careful: there is no standard at this level. Each 3D development environment, each 3D engine, has its own way of marking the beginning of a vertex or pixel shader. 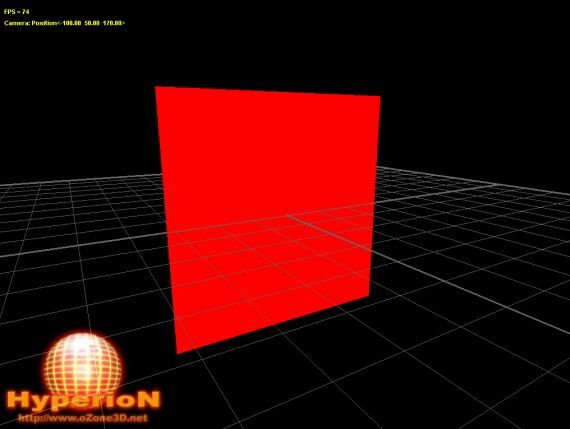 The oZone3D engine, which is hidden in Demoniak3D�s shadow, has chosen this manner which seemed the most simple, seeing that the same file contains both the vertex shader�s code and that of the pixel shader. This code line, apparently anodyne, is nevertheless fundamental. In effect it is mandatory and all vertex shaders should at least contain this function. But what does it do? In order to reply, we need a little more information. A vertex shader treats one vertex at a time. Therefore if there are 10000 vertices in our mesh, the vertex processor will perform the vertex shader 10000	times. A vertex is composed of a number of attributes (vertex attrib): position, texture coordinates, normal and colour for the most common. The	position attribute, or simply the position, is the most important. The coordinates (x, y et z) of the vertex�s entering position are those which have been given by the 3D artist during the modelling. 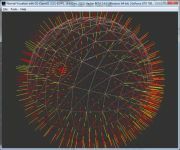 The vertex�s position is defined in the local space of the mesh (or object space). Theoretically, it is supposed to do the same thing. But there may be rendering artefacts due to different implementations of the OpenGL standard in the graphics	cards. The function ftransform() guaranties that the rendering will be the same	no matter what the OpenGL implementation is. gl_Vertex is a keyword of GLSL language. More exactly, it is one of the numerous variables predefined in GLSL, which permits direct accession to the	different attributes of the entering vertices and pixels. The same goes for gl_Position. gl_Vertex represents the entering vertex�s position, whereas gl_Position is	that of the outgoing transformed vertex. A vertex processor only deals with vertices as I mentioned earlier. This is	important to understand, as even if a polygon is composed of 3 or more vertices,	the vertex processor will never know it. It even does not know if an entering vertex is part of a polygon. It is therefore impossible for the vertex shader to undertake such operations as back-face culling because this operation requires the knowledge of all the vertices composing a side or the normal of this side. We will see in a future tutorial the use of other attributes of a vertex (normal, colour, texture coordinates, ...). The structure of the pixel shader is the same as that of the vertex shader. The beginning of the pixel shader is marked by [Pixel_Shader] and the entry point is defined by the function main(). This pixel shader only does one thing: write the vector 4D <1.0, 0.0, 0.0, 1.0> in the gl_FragColor variable. gl_FragColor is part of the predefined GLSL variables, just like gl_Vertex and gl_Position. The only aim of a pixel shader is to calculate the value which	will be written in gl_FragColor. gl_FragColor represents the pixel�s final colour in the frame buffer. But beware: certain tests situated after the pixel processor, such as for the alpha-test, may modify this affirmation. In effect, if the outgoing pixel processor does not pass the alpha test, it will simply not be written in the frame buffer. GLSL offers us a great liberty of expression! nVidia SDK: This SDK contains tens of examples on the GLSL shader prog. To have in one�s 3D developer toolbox! ATI SDK: ATI's SDK is now really cool and well organized (as nVidia!). There are many source codes and good whitpapers on many topics. As nVidia's sdk, to have in one�s 3D developer toolbox! Page generated in 0.0029962062835693 seconds.